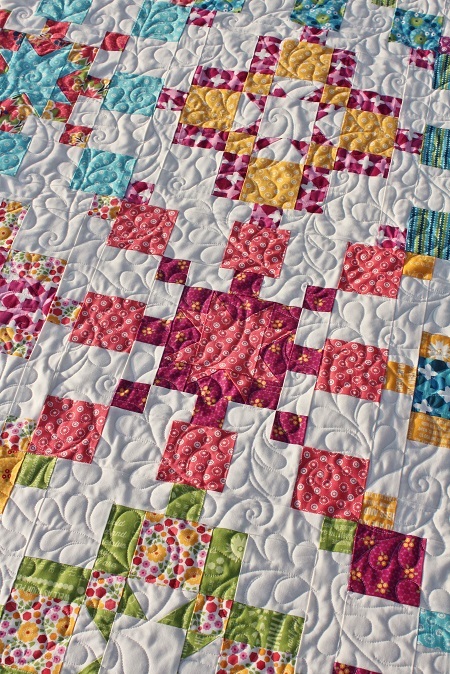 A few weeks ago I started piecing a fun pattern called Chic Sisters by Sew Kind of Wonderful. 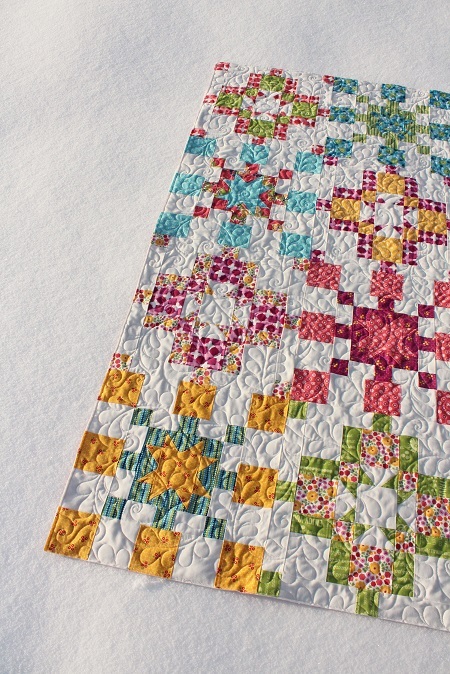 If you are a regular blog reader you know I love those patterns and the Quick Curve Ruler. I bought a bunch of Zen Chic ‘Modern Background Essentials’ for this quilt at Fabriculous and got right to work on this quilt. Well I guess I was too excited piecing it as I didn’t notice I had lost one of the light background fat quarters and then I cut one of the dark background fabrics wrong and it said right in the pattern ( they even underlined it) to make sure “all fabrics are right side up before cutting”. Whoops! Forgot to turn one pile and ruined that fabric. So I was one light block short and one dark block short. Drat! Then I found the light fat quarter I was missing at the back of a drawer! So a quick call to my favorite fabric shop Fabriculous and they came to my rescue and cut up what I needed! While I was making that order I thought why not buy a new Bernina while I was at it! Okay I had been eyeing it for awhile now and they just came out with the cutest design on it so how could I resist…I mean it has Dandelions on it! 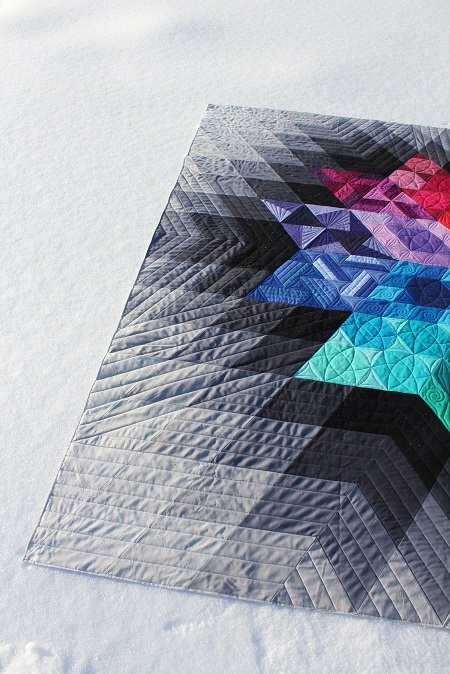 And its blue and grey…it matches my quilt! 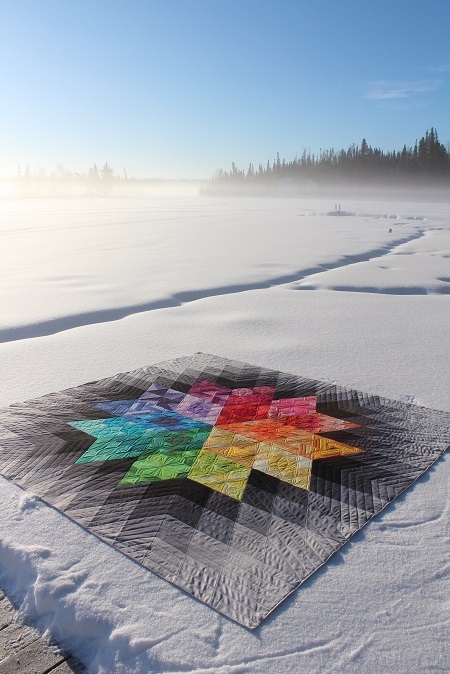 Look how pretty she is and she quilts like a dream. I needed a new lighter weight machine to take to retreats and guild UFO days as my Janome is so heavy. So now I have a new machine and fabric to finish this quilt top. Yeah it’s pieced! 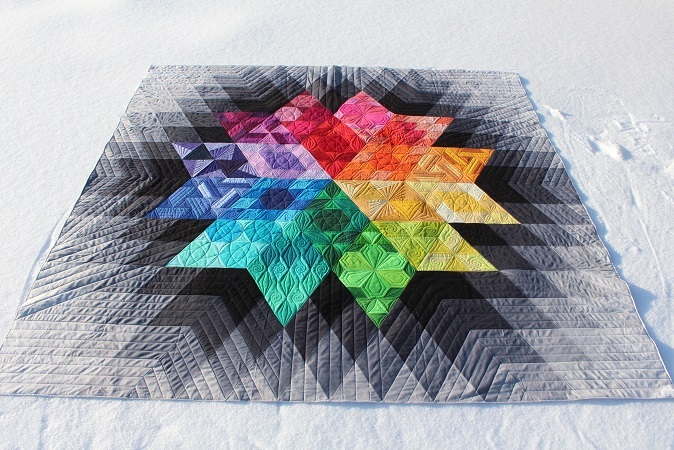 Now to figure out how to quilt it and find the time! 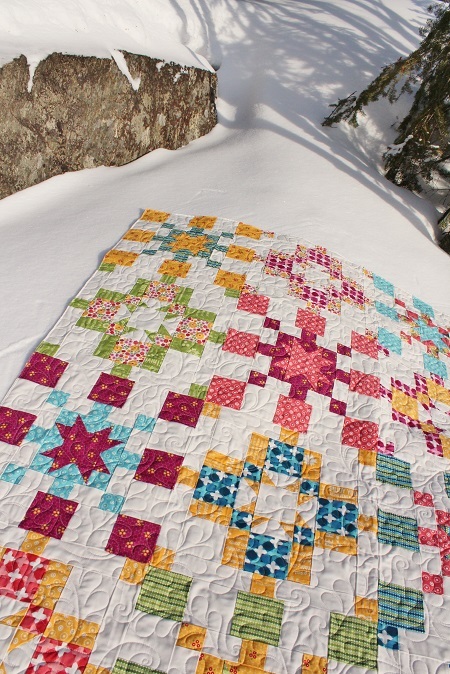 This is Linda’s Sunday Ride quilt and the pattern is by Cherry Blossoms Quilting Studio. This will be a wedding gift for one of her granddaughters, what a lovely gift! The applique pieces are all fused and then she did a machine zig zag stitch to hold all the pieces in place. Lots of hand embroidery stitches as well. 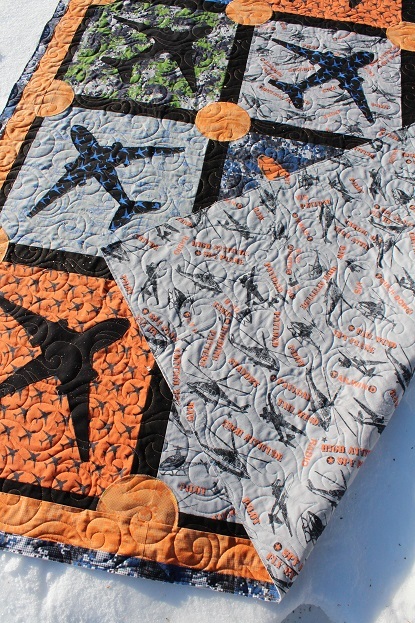 She asked for custom quilting and liked how the cover of the pattern was quilted so gave me that to use as inspiration. 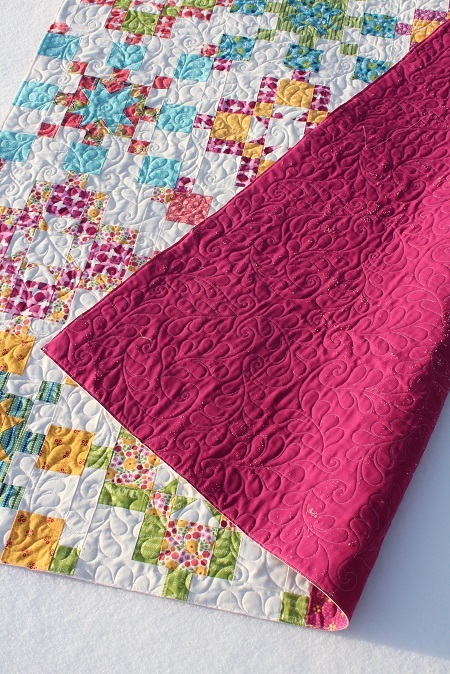 I quilted the blocks similar to the pattern but then added the loops in the sashing and the feather curl design in the outer border. I stitched in the ditch around the main elements of the applique pieces. I quilted the whole quilt in white So Fine thread as all the applique stitching was done in white thread. Made my job easy with no thread changes. Batting is Quilters Dream Blend. 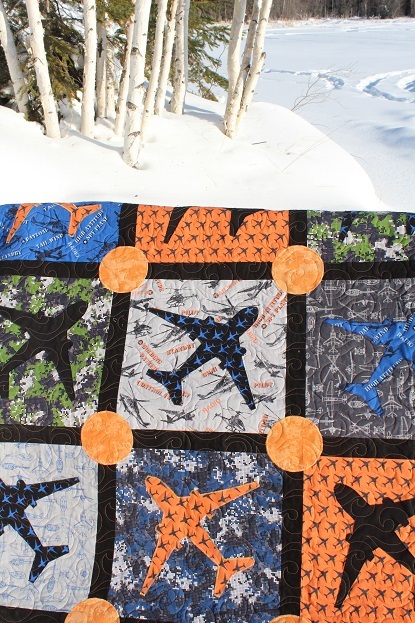 This is Sheri’s City Slicker quilt and it is one of our latest Highway 10 Designs patterns. 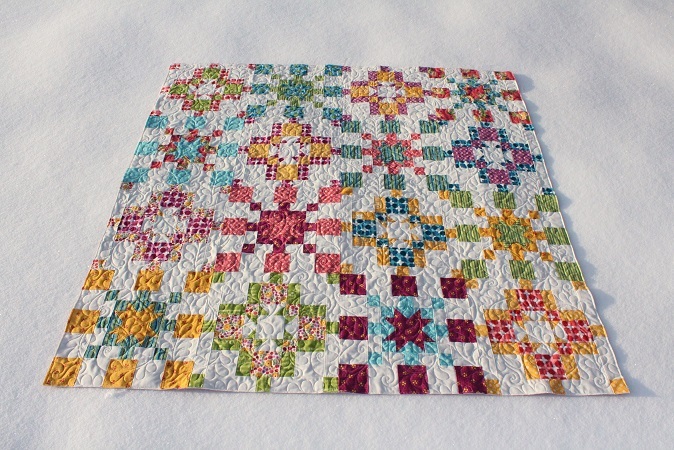 Sheri used the first Jelly Roll she ever purchased, over 10 years ago, so not sure what Moda line it is. I thought that was pretty amazing to hold onto a jelly roll for that long, but then again I bet many of your have jelly rolls that old too! I picked Rhapsody for the pantograph design, Light Beige So Fine thread and Quilters Dream Blend batting. 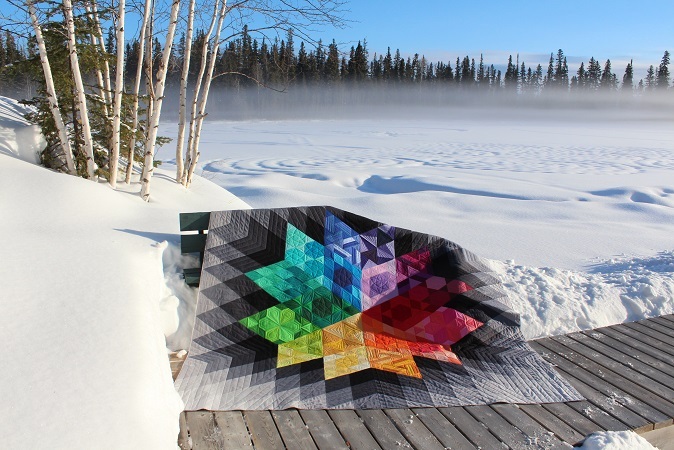 Next week I’ll be down in Winkler, MB teaching this pattern at Road 17 N quilt shop. 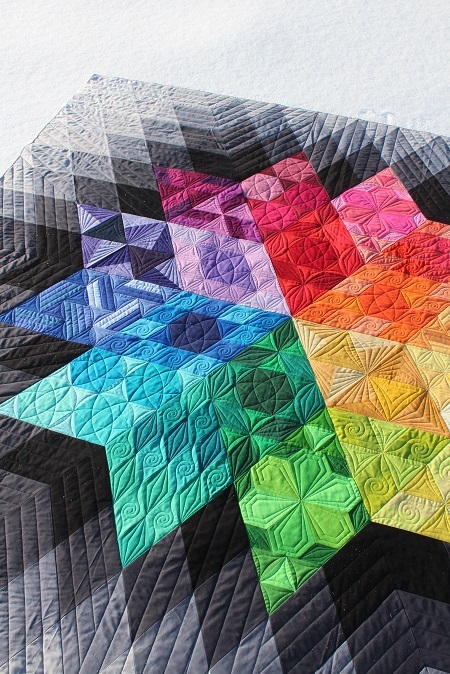 I’m really looking forward to teaching a beginner piecing class and meeting new quilters! I used the Feather Curls panto on this one to add a soft texture to the piecing. White So Fine thread on top and white Bottom Line on the pink backing. 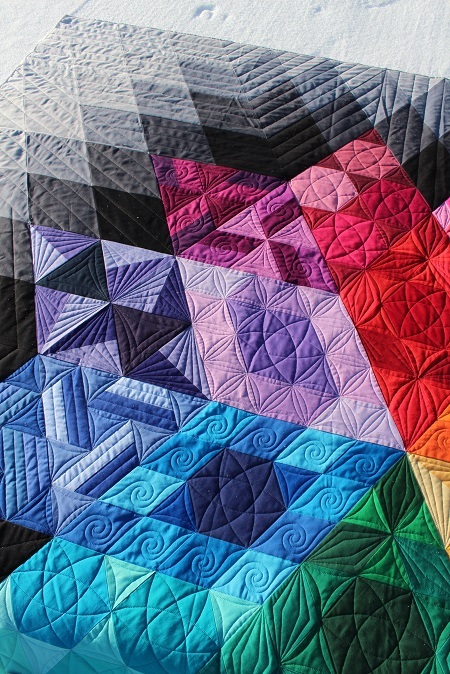 Quilters Dream Blend batting. We have been having crazy weather with warm days and snow melting and then cooler days with lots of snow fall! 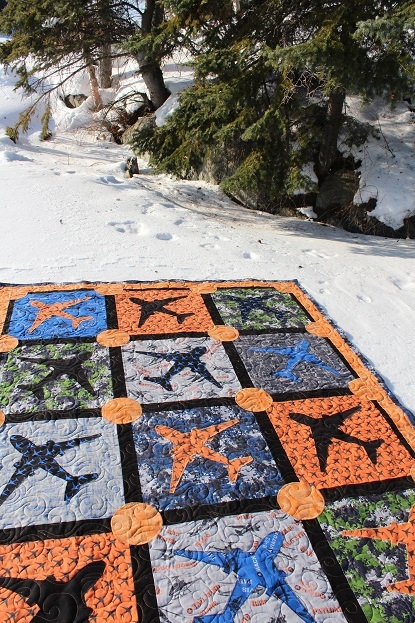 This is Phyl's Gravity quilt and it is a pattern by Jaybird Designs. 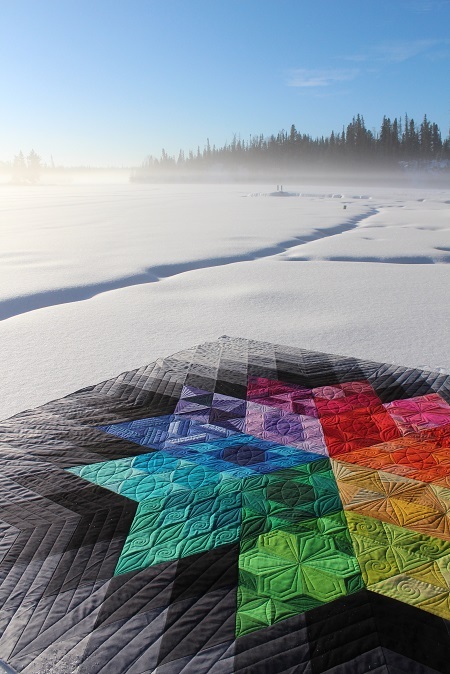 I quilted one last year and you can see it here. Phyl liked how I quilted the first one so left if up to me to make any changes I wanted. I was really happy with the straight lines for the background so kept that the same as it really allowed the center to shine. 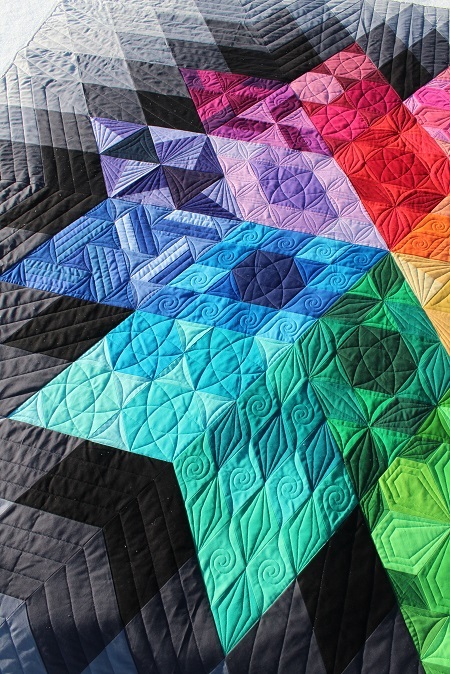 I quilted the blocks similar but changed a few blocks so it wasn't exactly the same. It was a beautiful morning and only -3' with fog. Made for great pictures! I used invisible MonoPoly from Superior thread for the top and a grey Bottom Line for the bobbin thread. Its a great time saver as there was no thread changes. Batting is Quilters Dream Blend. 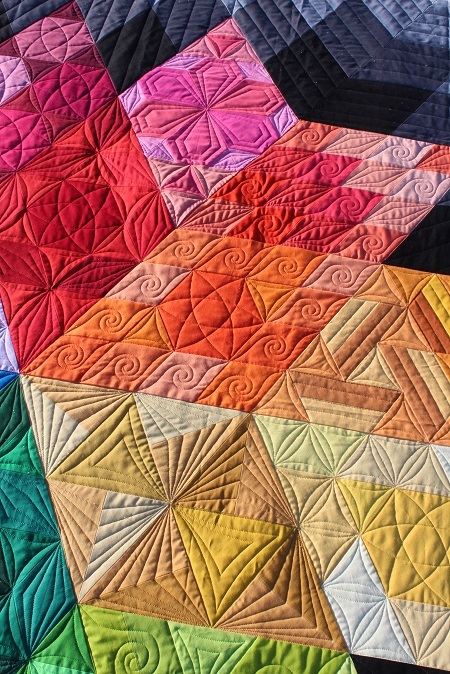 When I quilt the straight lines I mark them out first with a Bohin chalk pencil and divide the diamond spaces in fourths. When I am echoing the star the space is 1 1/2"and when I mark the rays they are spaced 1 5/8". 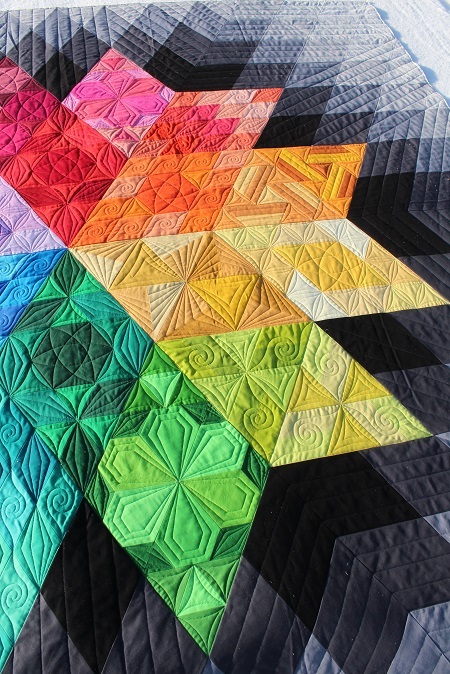 The quilting is 90% ruler work and I used three different sizes of the Quilted Pineapples Curved Templates for the blocks. 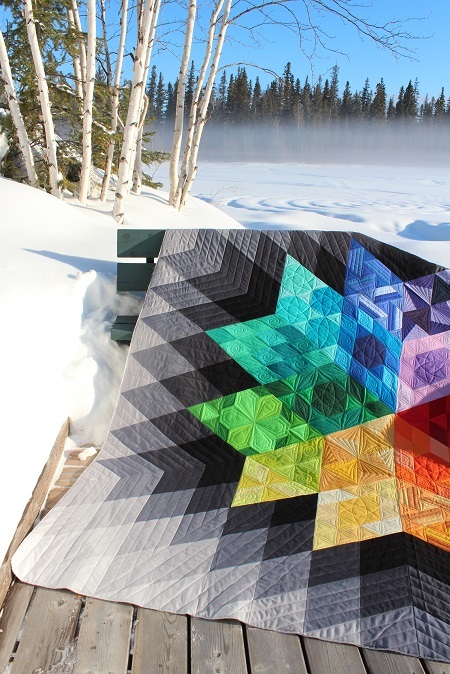 I ordered Linda's new QP Edge rulers and they arrived just as I was finishing this quilt so only got to use them for a few of the rays. I think they will be a great addition to my ruler collection as the marking on them are great! You can see the snow is now higher than the dock! We had 10" of fresh snow fall on Monday and now the temperatures are going above freezing so it's going to be a big wet mess around here soon. 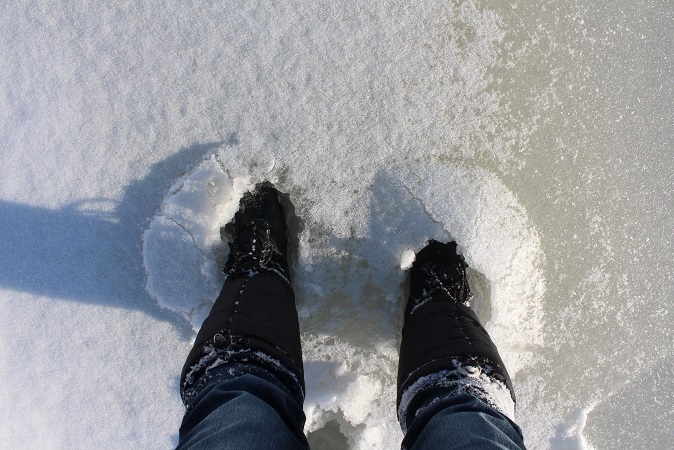 This is ankle deep slush where I use to keep the ice clear from snow! 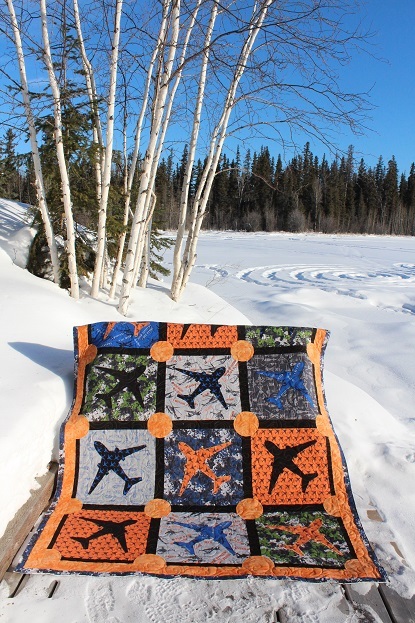 This is Hollie's 'Ready to Take Off 'quilt and she made it for her husband. 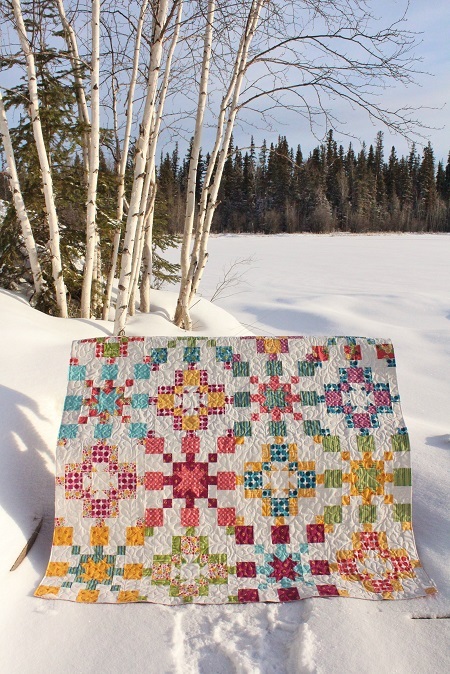 She used a kit by Windham Fabrics and you can download the pattern for free here. 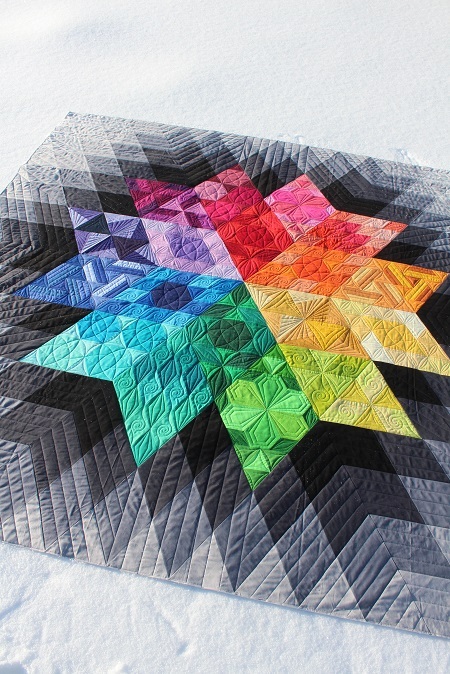 I used the Bora Bora pantograph to create a windy quilting textures. 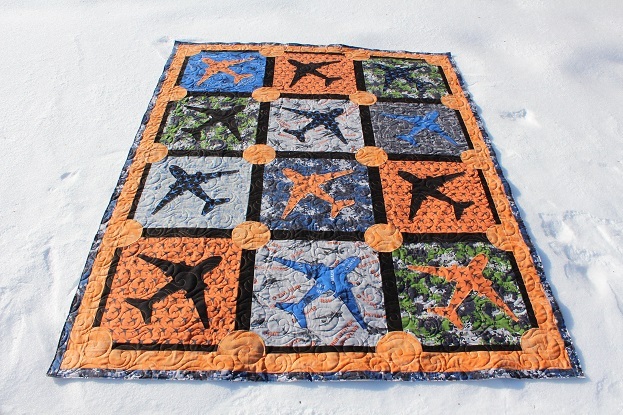 The batting is Quilters Dream Blend and the thread an orange So Fine.